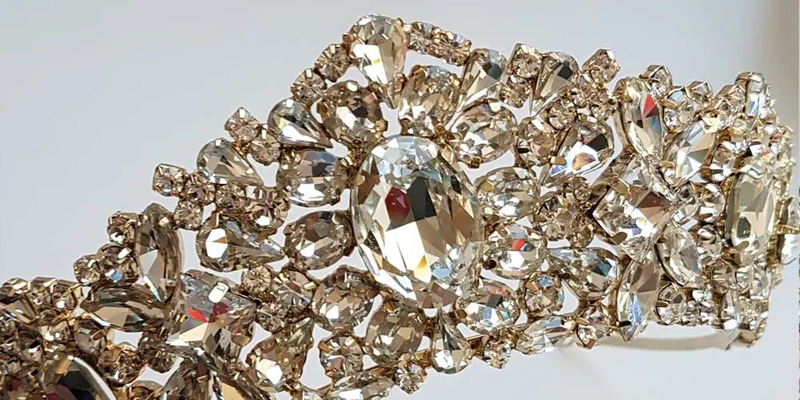 As wedding gown fashions continue to change each season, wedding accessories are no different. What ever may be your love? From a stunning gold wedding crown to a gorgeous bold floral headband. There is just so many beautiful wedding headpieces available, just how is it possible to narrow it down to one? Considering your overall setting. Will your be hair up or down, structured or loose and also including your bridal gown detailing? Do you wish your hair to have a bold statement piece or a subtle splash of detail? In order to choose your perfect bridal headpiece, your wedding hairstyle needs to be considered. Trending hairstyles for 2019 are all about texture, texture and more texture. Bridal hair is trending more towards the cool girl style. It’s increasingly moving further away from fixed curls and structured, heavily sprayed looks. It’s “all natural” and “relaxed styles” that are the new chic. Whether you’re a vintage, modern, or a traditional bride. Hair accessories are a category not to be overlooked. They are basically jewellery for your hair. What’s not to love about that? 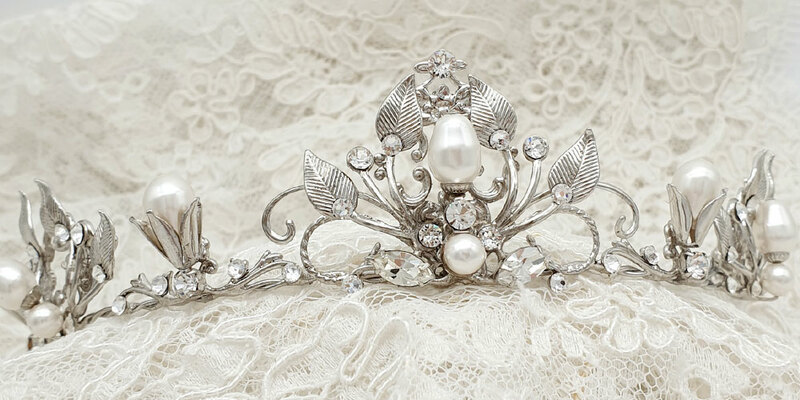 For classic or traditional brides, a bridal crown, tiara, headband or comb is timeless and chic. 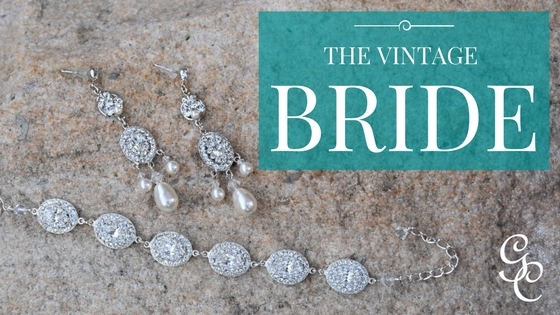 For the vintage bride, a gorgeous pearl or crystal comb, headpiece or headband are perfect. 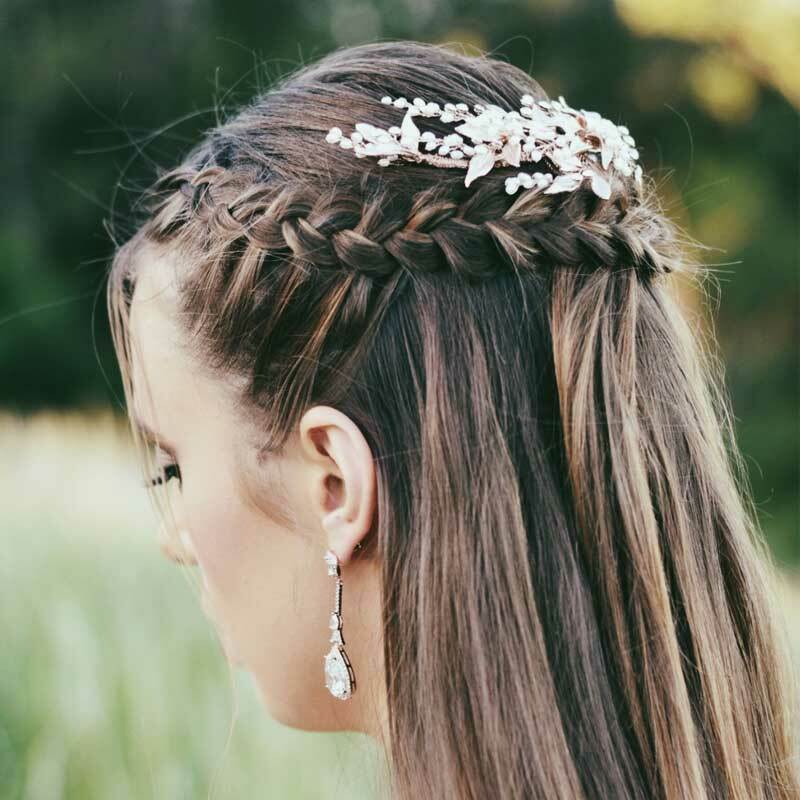 While for bohemian brides, hairpins, hair vines, clips with flowers, blossoms, branch motifs, or leaves are the way to go. A bridal hairpiece with crystals, rhinestones or feathers are perfect for the glamorous bride. While sleek and sculptural pieces in gold, rose gold or silver suits ultra-modern tastes. The best thing about your wedding hair accessories is that it truly ties your bridal look together. Especially if you opt for simple jewellery. It’s a great way to add that special statement piece. While your bridal hairstyle is a factor in what type of bridal headpiece is right for you. Many can be versatile enough to be worn with your hair up, down, or half up. So if you fall in love with a specific hair accessory, you can most certainly figure out a way to wear it! 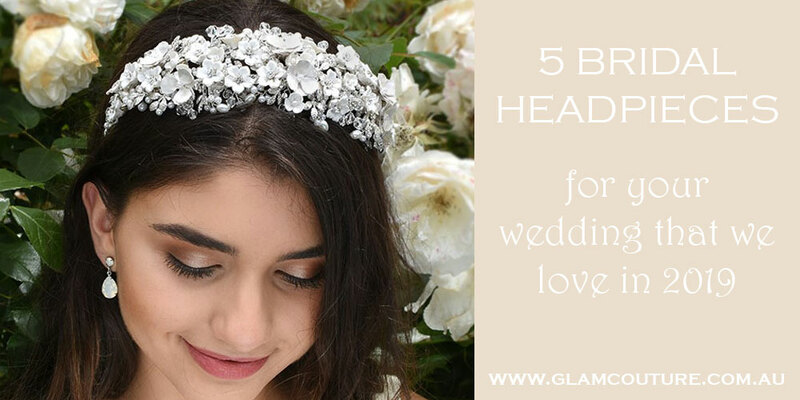 All this being said we want to show you our top 5 bridal headpieces that we love in 2019. You will be inspired. 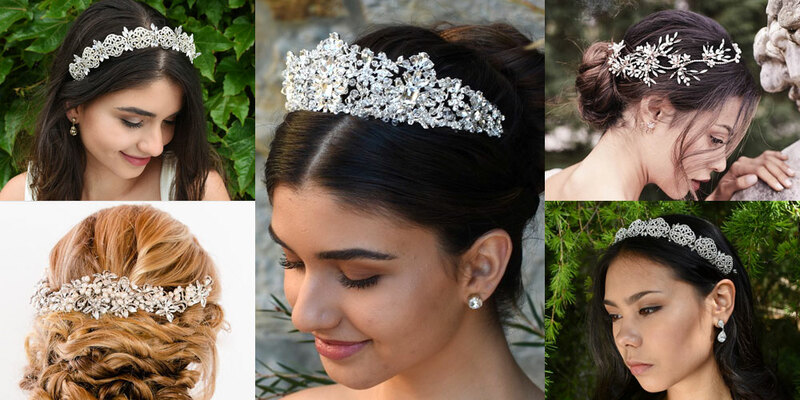 One of our favourite wedding headpieces are our bridal crowns and tiaras. 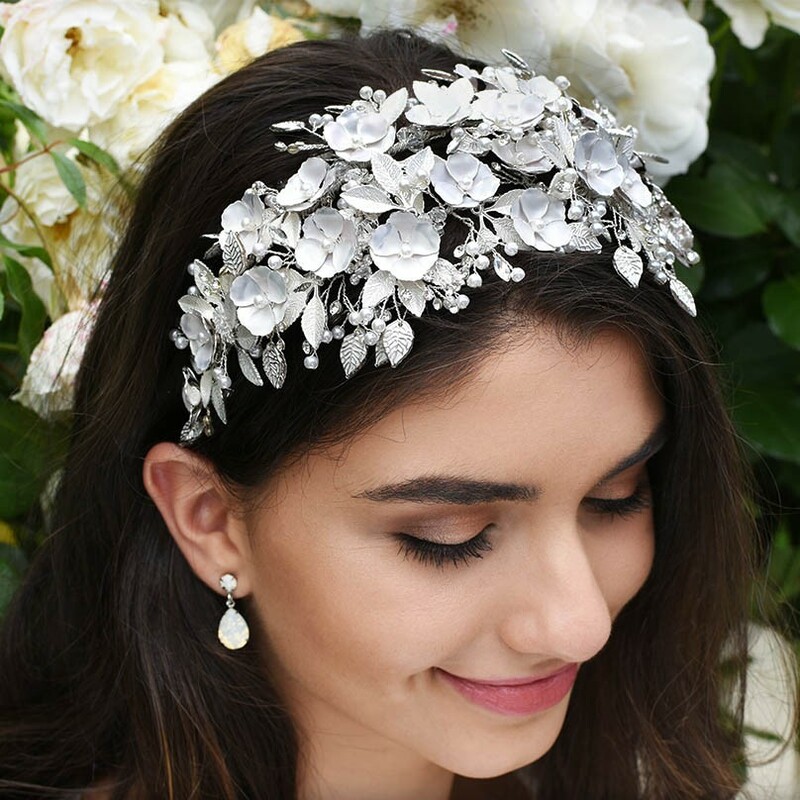 Having been trending for a while now and set to trend for a while to come, these headpieces make a gorgeous statement for any bride. 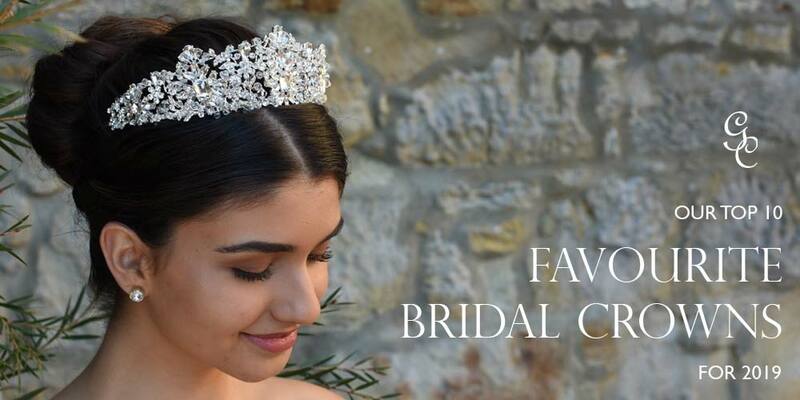 With great diversity including gold, silver and rose gold crowns with your choice of embellishments such as Swarovski crystals, Swarovski pearls, fresh water pearls, diamantes and much more. They are versatile with a complete range of hair styles, all up in a high or low bun, half up and fully down, bridal crowns really are just a great choice. So to begin our top 5 favourite headpieces we have chosen our brand new Bespoke ‘Maleficent’ bridal crown. 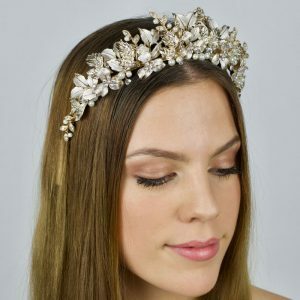 This gorgeous crown can be handmade in silver, champagne gold or rose gold. We love it for its soft elegant beauty, adding a stunning feminine touch to your bridal styling. Therefor not only can you choose the colour of the plating, you can also choose the colours of the Swarovski crystals and Swarovski pearls. We are so very proud that it’s one of our own custom made designs. 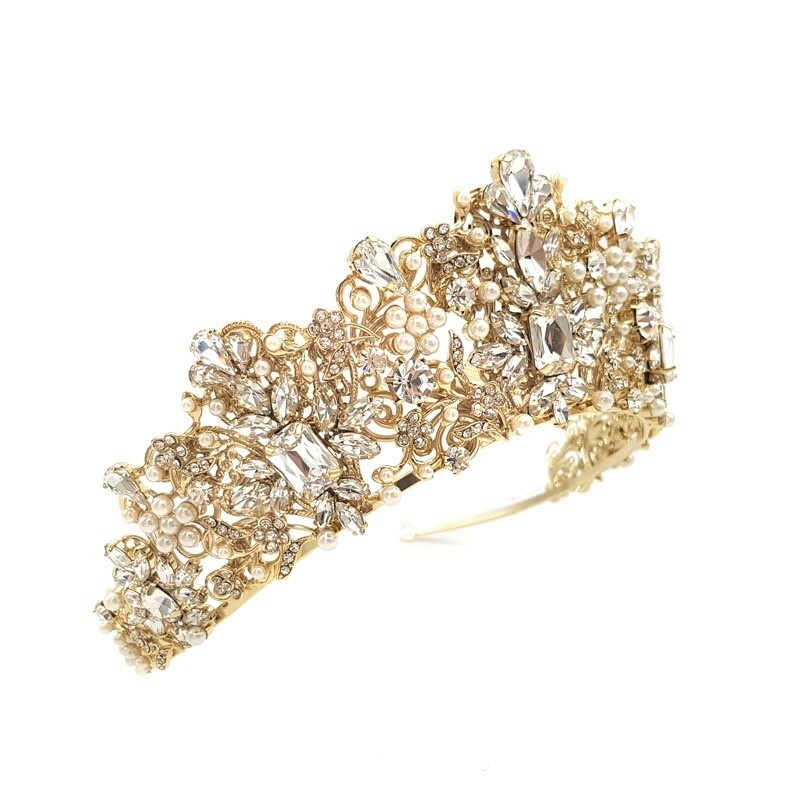 Another one of our favourite wedding headpiece is our bridal headbands. They are simple and comfortable to wear. They really look stunning with effortless all down hair style, what’s not to love. Headbands are really setting in as a trend for 2019. Additionally, smaller headbands have been popular for a while now, with feminine floral headbands or even gorgeous art deco headbands. However, with wide floral headbands especially trending in the UK, we have seen a real movement here in Australia with similar styles. This brings me to our next favourite bridal headpiece. We love our ‘Camilla’ headband and it’s obvious why. This magnificent headpiece is a real work of art and an incredible statement piece. 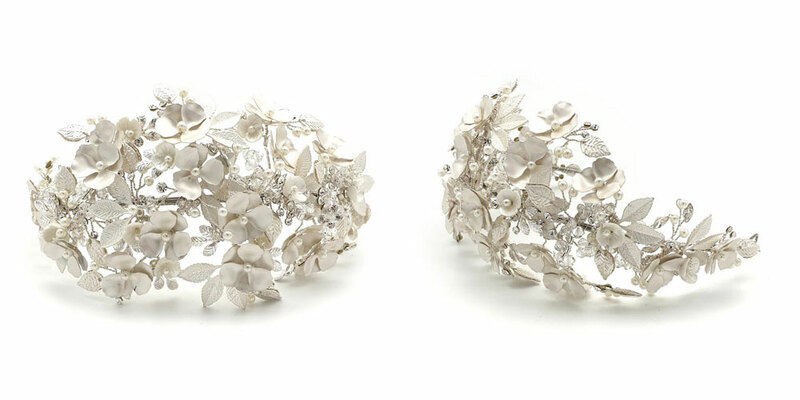 Featuring gorgeous metal and ceramic flowers with sprays of crystals, pearls and leaves all intertwined using silver wire creating this stunning masterpiece. 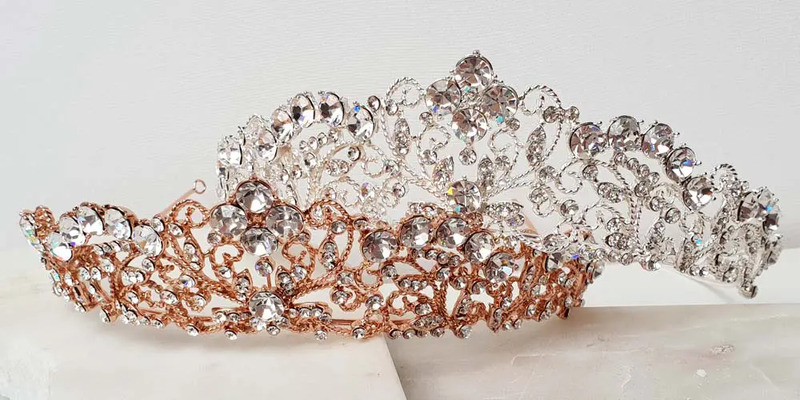 Some tiaras come with the flexibility to be a headband also, just like the next bridal headpiece in our top 5. 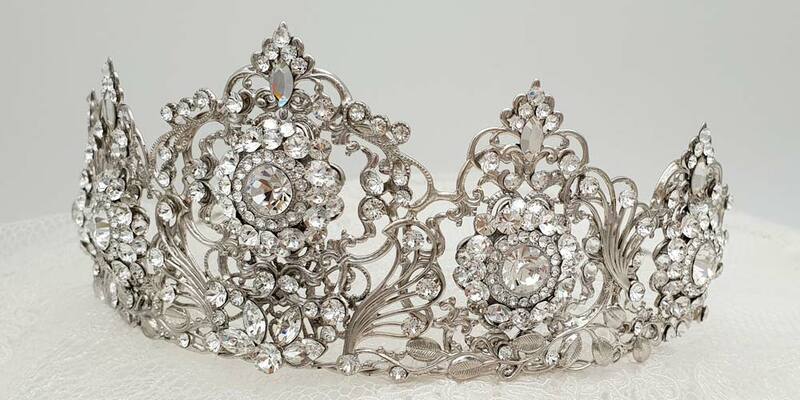 Our beautiful ‘Georgina’ crown with its gorgeous intricate floral, leaf and crystal detailing. This is available in pale gold, rose gold and shiny silver. It’s obvious to see why we have chosen it. 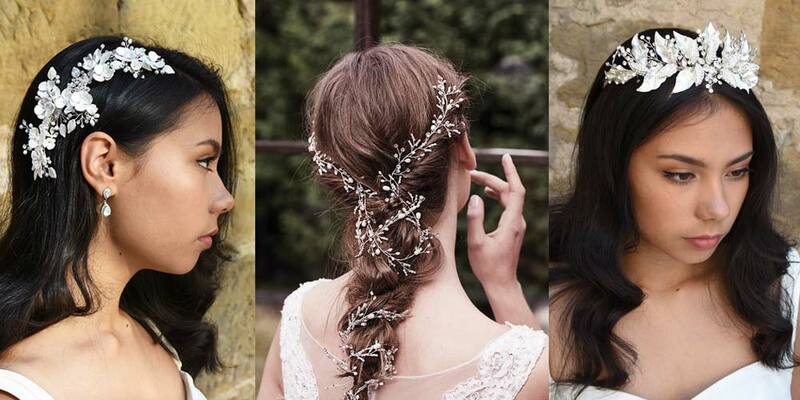 Bridal hair vines are a great way to add some versatile detail to your bridal hair style. They have been a strong trend for a little while now and continuing to do so. With flexibility to wear your hair vine intertwined through a soft braid, compliment your half up style or even wear like a headband. The only limit to hair vines are your imagination. Add a stunning soft feminine touch that compliments your hair style and what an elegant look it is. Works perfect as a vintage headpiece or bohemian headpiece. 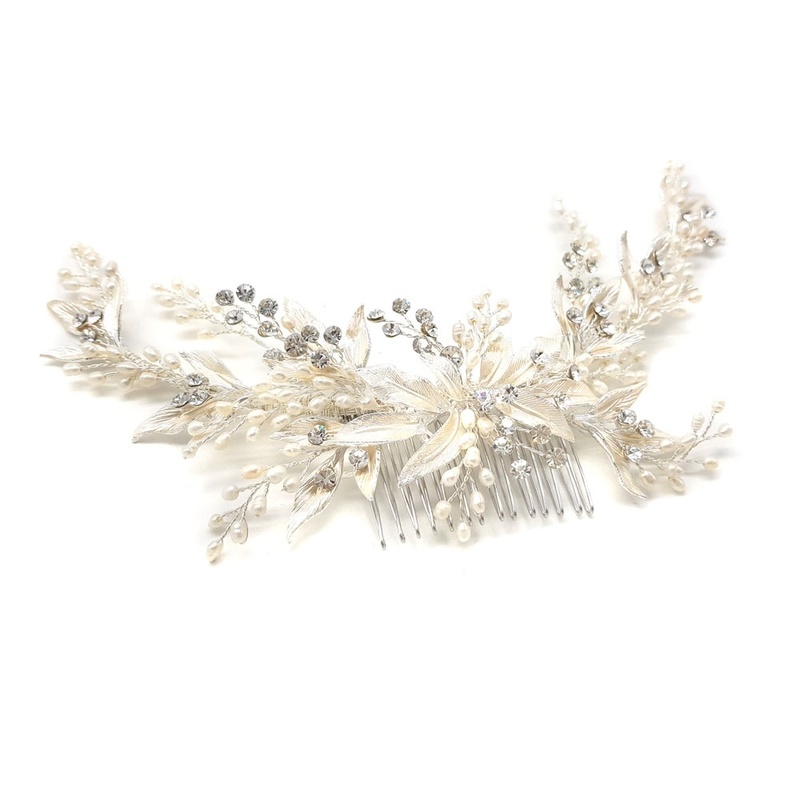 Our favourite hair vine making our top 5 bridal headpieces is our ‘Lolla’. 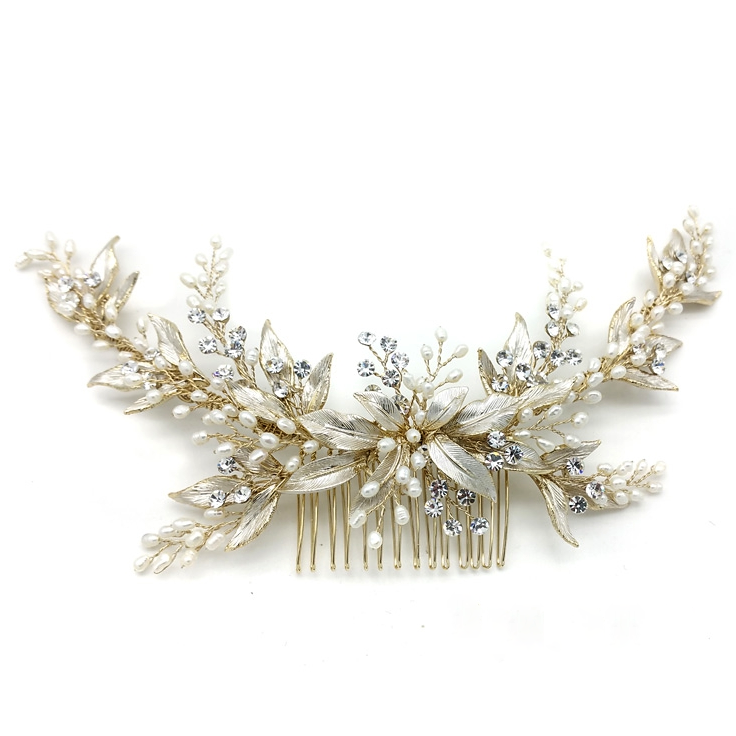 A bridal hair vine packed with gorgeous intricate detail, it’s hard not to fall in love. 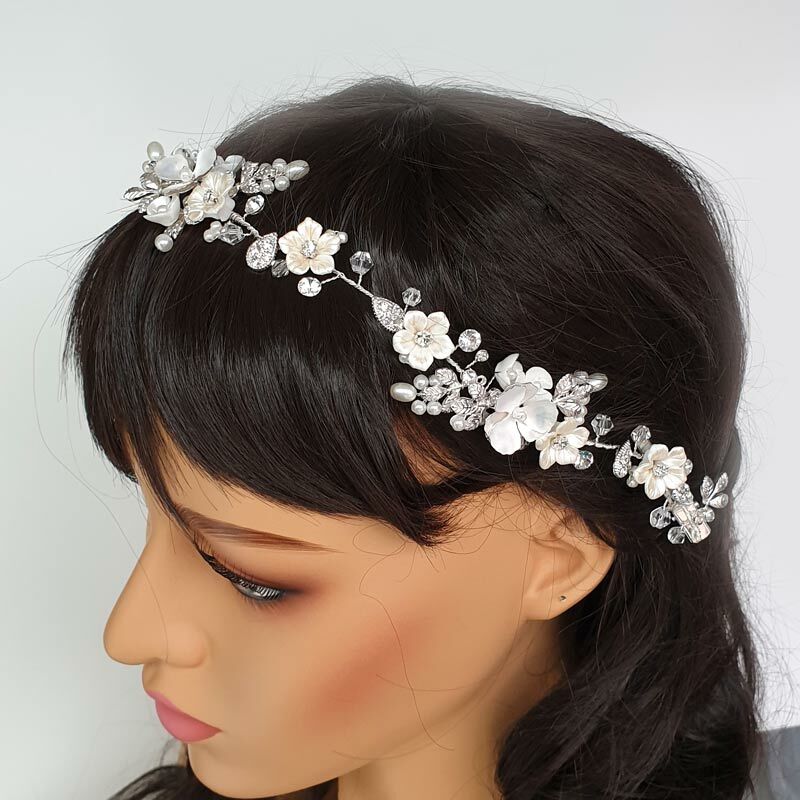 Made with beautiful soft ivory ceramic and white metal flowers combined with pearl and leaf sprays and scattered crystals all intertwined together creating this glorious piece. Bridal hair combs have set back in as trend for brides this year and it’s really no surprise. Hair combs are not bound by a bridal theme and can add a touch of any theme you have going. 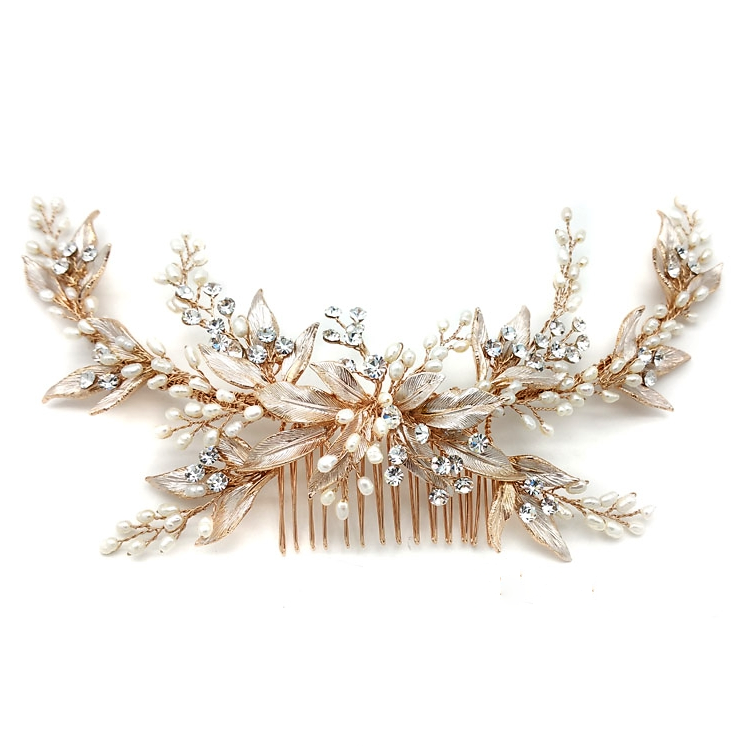 If you are after art deco headpieces, vintage headpieces or even modern headpieces, bridal combs are a great place to start. We love the diversity of size and positioning that they bring not to mention that there is a hair comb to suit almost every bridal hair style there is. They are also a great addition to your fabulous bride tribe styling. Our top pick for hair combs is our classic ‘Amelia’. Amelia’s enchanting design ornamented with fresh water pearls, sparkling crystals and delicately hand painted leaves is just breathtaking. Available in either silver, rose gold or champagne. With bridal crowns and tiaras still trending amongst brides. Therefor we wanted to inform you of our top 10 modern favourites to help keep your bridal look fresh, elegant and luxe. 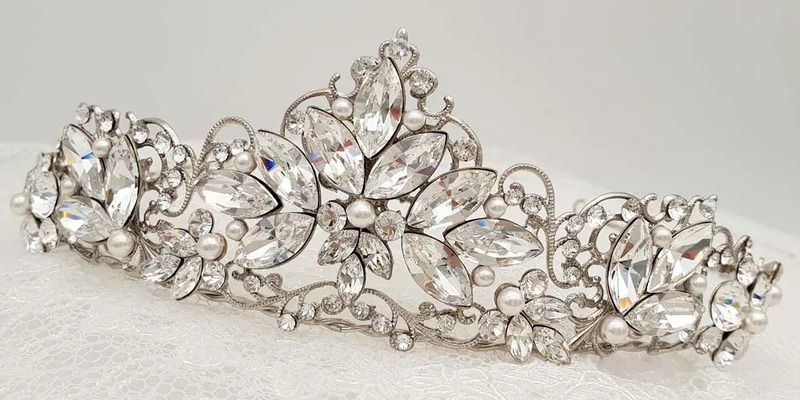 Bridal crowns and tiaras have long been the bridal accessory of choice for royals, rich, famous and the refined. It’s a timeless accessory to pass down as an heirloom from generation to generation. Crowns and tiaras are created in endless styles in both modern and classic designs suiting boundless hair styles. Let’s get started with this incredible collection. This bridal crown is nothing short of gorgeous. It oozes luxury with its intricate detailing making it a real piece of art. 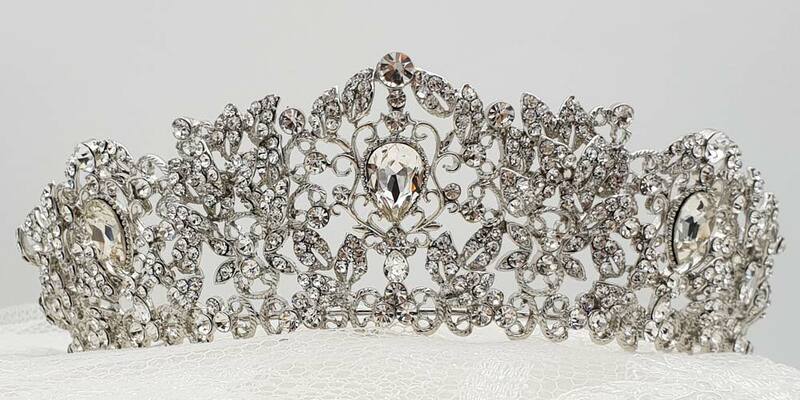 As part of our bespoke collection this crown is custom made for our brides and exclusive to Glam Couture. Made from genuine Swarovski Crystals and set in silver, gold or rose gold. Each customer can add their own flair by adding colour from our Swarovski colour range. We love working with brides to create unique pieces. 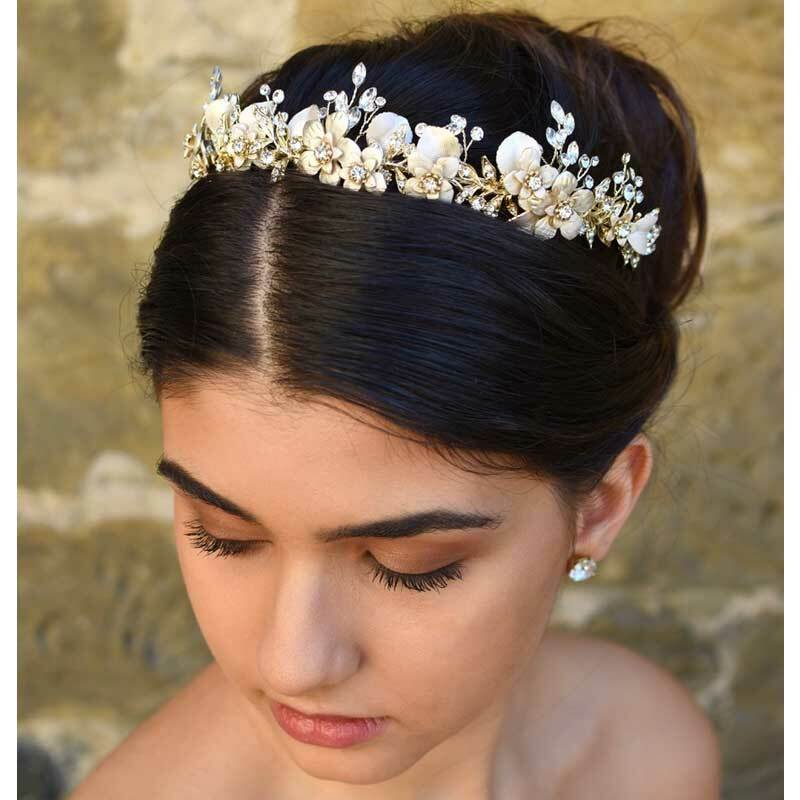 The timeless elegance of this crown encrusted with Swarovski pearls and dazzling Swarovski crystals creates the perfect combination to compliment any bridal look. This is an exclusive design to Glam Couture from our bespoke collection with the same versatility as the ‘Kelsey Crown’. Custom made in either silver, gold or rose gold. 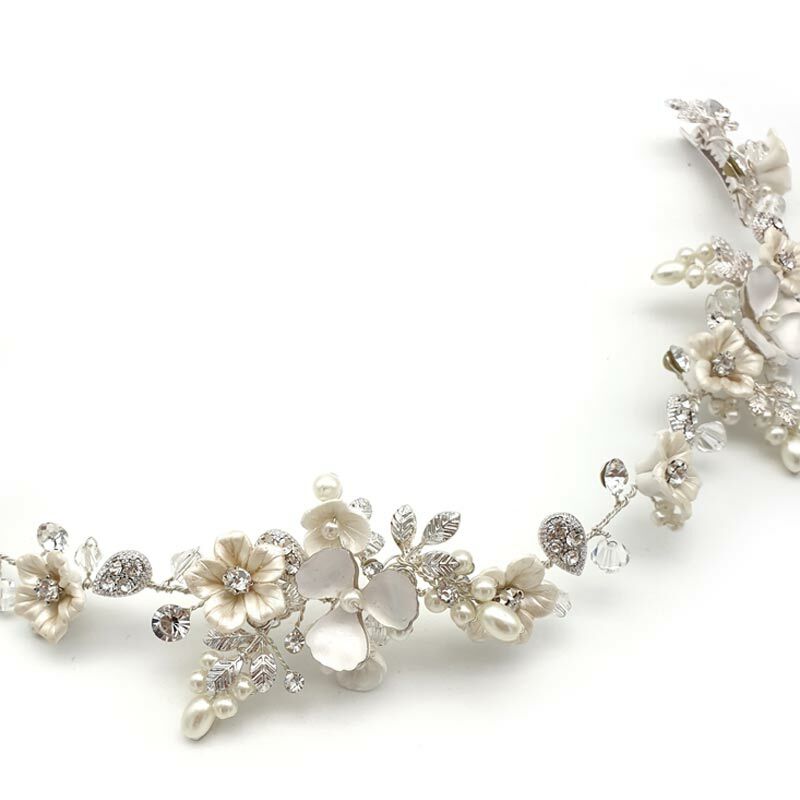 Our ‘Madalyn’ crown is a feminine luxury piece featuring gorgeous intricate floral, leaf, crystal and pearl detailing. This stunning piece is handcrafted in Australia and can be customised upon request. It’s easy to see why this crown has made our top 10 favourites. Our ‘Chandra’ bridal crown is elegant and effortless in design with a beautiful shape and size adding to its appeal. 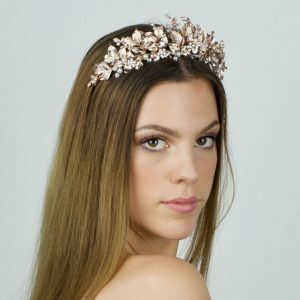 Not only is this stunning crown available in the popular silver but also rose gold bridal crowns as well. 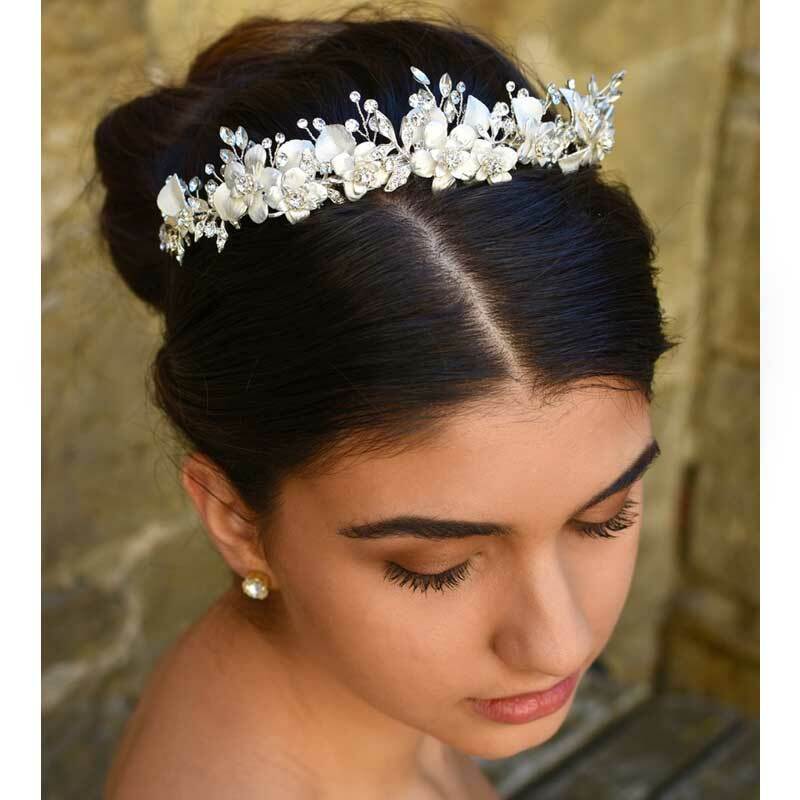 Our stunning and popular ‘Tessa’ crown screams royal elegance made from sparkling crystals ready to adorn any stylish bride-to-be. Versatile to suit a range of hair styles and available in rhodium silver, champagne gold or rose gold. Our Natalia crown is simply stylish luxury. It is crafted from sparkling crystals with pearl highlights creating the perfect masterpiece. A sure pick for the 2019 bride-to-be, to rock her bridal look. Choose from rhodium silver or champagne gold. As one of our largest crowns in our collection, our ‘Eileen’ crown creates a stylish bold statement. 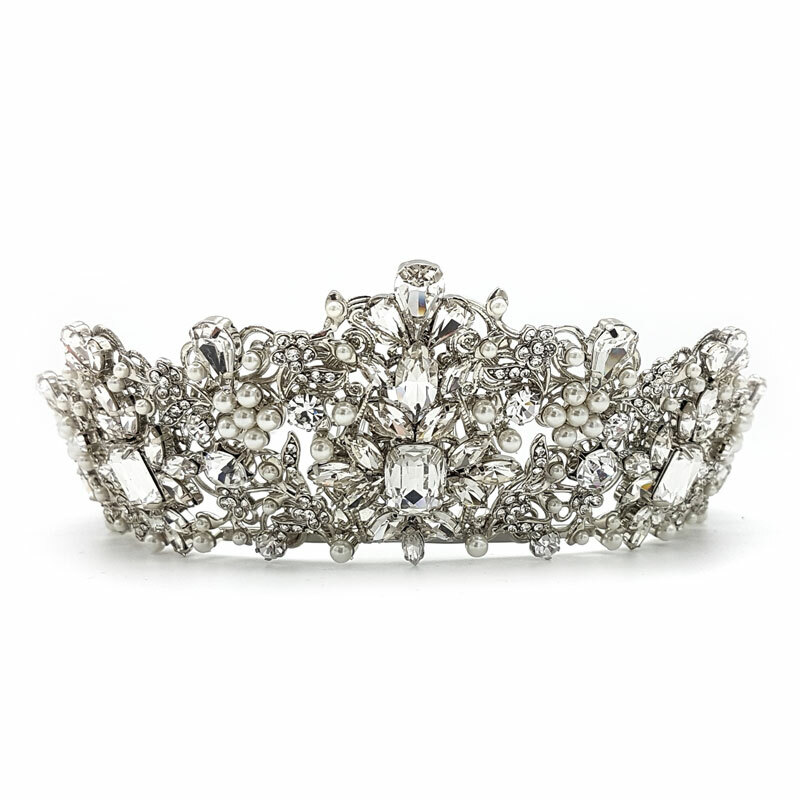 With stunning sparkling detail this silver crown boasts an intricate deign embellished with sparkling crystals. Arrive at your wedding with luxury on the most significate day in your life. She is utter beauty, the perfect statement piece for a luxurious bride. 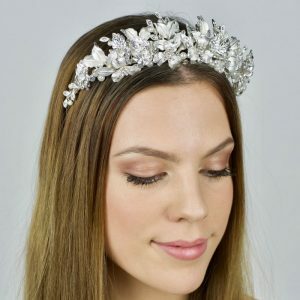 Our ‘Tara’ crown is a bold and elegant design that beautifully shines with quality crystals. Choose from the stunning silver or champagne gold options. Enjoy your timeless styling for the rest of your life. An incredibly beautiful bridal crown that’s also versatile as a headband. Our feminine ‘Georgina’ piece features gorgeous intricate floral, leaf and crystal detailing. Adorn your hair in a way that is only limited by your imagination. This stunning piece is handcrafted in Australia and available in silver, champagne gold and rose gold. 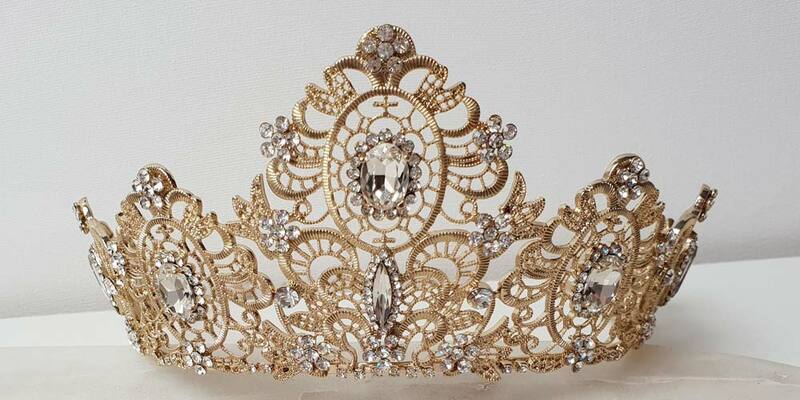 Make a real statement with this glamorous tall champagne gold wedding crown. ‘Themis’ is intricately detailed and handcrafted using sparkling crystals. Only a stylish bride-to-be would dare pull off this stunner. With an extensive collection of bridal crowns it was particularly difficult narrowing them down to our top 10. 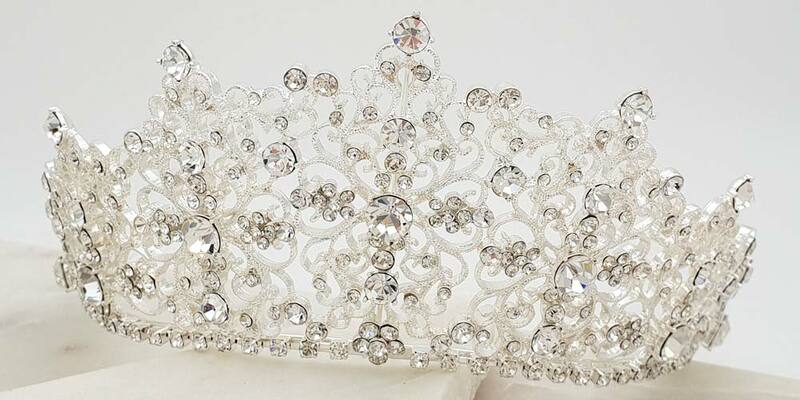 Check out our full range of crowns and tiaras HERE. 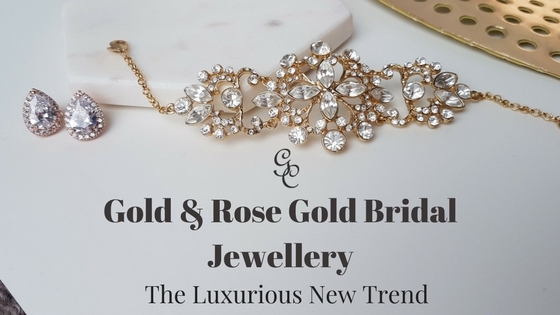 The ‘Gold Rush’ has returned with gold accessories trending again!